For her appearance at the Umang show, Karisma picked a Varun Bahl sari to wear. With her hair in a wispy updo, she rounded out the look with jewelry from Anmol. 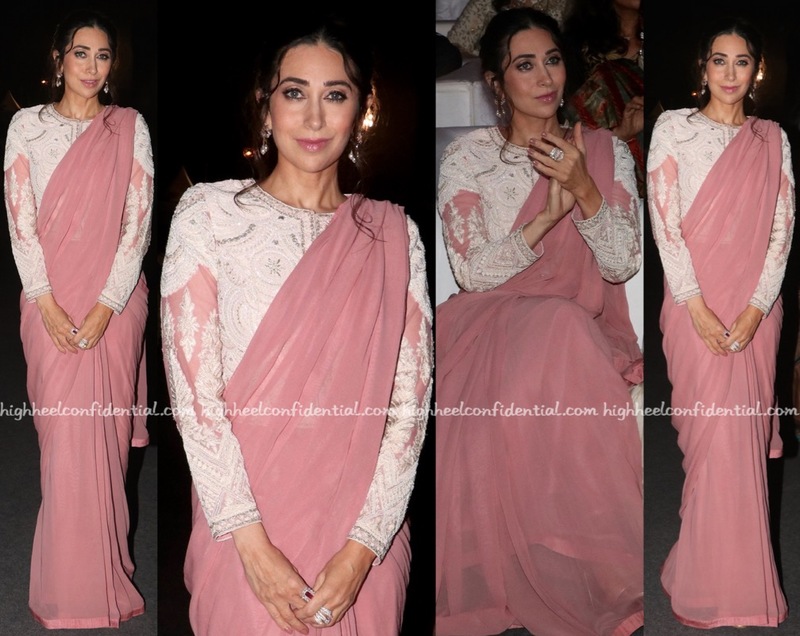 I wasn’t the biggest fan of this look; the sari didn’t do much for Ms. Kapoor! I can’t quite put my finger on it but perhaps it’s the starkness of white against the plain dusty-pink? Oh I love it! Would wear this in a heartbeat ? Don’t like this sari and blouse, it does nothing for her. Her face does look lovely – she looks really young! She seems a little washed out. Like she is really unwell and was forced to dress up and attend the event. Yup! I think so too! Also she looks like she wasn’t feeling well but had to attend the event. I think it’s also the lack of shape on the blouse (and perhaps if it had stopped above that sheer pink patch, it may have fared slightly better). Surprising miss by both VB and Karisma. Her face looks odd. Can’t point my finger at what it is….the makeup around her eyes perhaps? Also her blouse looks 2 sizes too big. A rare miss for her. 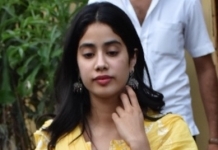 She reminded me of Salma Agha in these pics!! These pics aren’t the best pics from the event.I saw better pics n videos on Instagram, n she looked heavenly. N in these pics, its vice versa. That’s Viral Bhayani for ya. Actually, nothing is working. The saree with that blouse, the hair and make up, not working at all. Rare miss from her. She looks like the japanese cartoons. Whitewashed. The saree is pretty and if the blouse were just a bit more fitted her outfit would stand out more. Make up and hair also take down the look a few notches. Karisma looks dignified and classy ! Not like the rest who were dressed for a wedding or awards show ! The saree is event appropriate. She looks simple and lovely.